Home > Eco Touch Leather Care 16 oz. Clean and condition leather in one step! 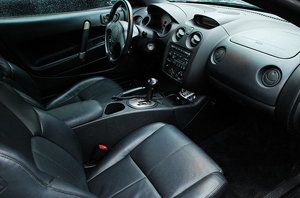 Eco Touch Leather Care uses the latest advances in "green" chemistry to clean and condition leather seats as well as any leather cleaner you've tried. Eco Touch Leather Care safely removes dirt and grime while replacing lost oils. Your leather will feel soft and supple with a natural-looking sheen. Eco Touch Leather Care is a pH-balanced formula that's safe on leather. It's made of filtered water, coconut-based cleaning and conditioning agents, and vegetable glycerin to safely clean the leather. In one step, Eco Touch Leather Care gently removes soil and restores oils to keep leather feeling like new. Leather is a natural material. It only makes sense that a natural product would be the best choice to maintain it, right? Eco Touch Leather Care does not dry out leather or make it brittle. It is safe to use on all leather upholstery and furniture. Make your leather look and feel its natural best with Eco Touch Leather Care. I have used this product on my Mercedes-Leather after deep cleaning it. This is a VERY VERY VERY effective product that conditions leather with AMAZING INGREDIENTS, leaving a matte look and very smooth, very natural texture. The smell is also amazing, best in the world. I talked to the co-founder of this company and he said it is greatly unknown because people tend to go to bigger brands to buy products....Well, I greatly promote his company and their products. They are absolutely amazing in every sense of the word.